Acoustiblok resolved a noisy well motor issue that was affecting some nearby residents for Three Valleys Municipal Water District (Three Valleys MWD) in California. 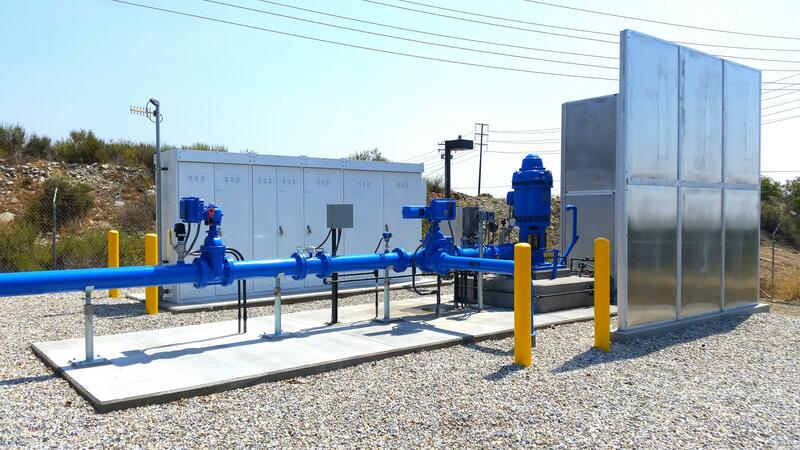 The source of the noise was a new groundwater well that had been drilled, and a pump and variable frequency drive (VFO) motor installed on the District’s property in Claremont. Shortly after the new well went online in August, 2014, it became apparent that the motor was producing a high frequency noise during operation. The installation of Acoustiblok's All Weather Sound Weather Panels® (AWSP’s) significantly reduced the noise for neighboring residents and provided a more permanent and attractive solution than the temporary barriers that had been erected to deal with the issue. The Three Valleys MWD is a wholesale water agency that was established back in 1950. It was originally, named the Pomona Valley Municipal Water District however, in 1981 the name was changed to Three Valleys MWD to better reflect all of the areas it served—the Pomona, Walnut and eastern San Gabriel Valleys. Presently, the District's service area covers 133 square miles of Southern California. Wells tapping underground aquifers have been used in the area since the late 1800’s when small settlements were established. While the noise was not as apparent during daylight hours due to road traffic noise, there was a nearby residence that was impacted by the noise coming from the well motor during the night. The water district installed a temporary barrier and then began looking for a more permanent solution. According to Ben Peralta, a Three Valleys MWD engineer working on the project, after doing some research, they reviewed multiple options and decided on Acoustiblok’s All Weather Sound Panels because they were reasonably priced, attractive and meet their goals for sound reduction. Sound pressure is measured in decibels. The average person can hear sounds starting at 0 to 1 decibels. A normal conversation is at around 60 decibels and not loud enough to be annoying or harmful. Once a sound reaches 85 decibels or higher (lawnmower, pump, motorcycle, pop concert) it can cause permanent damage to a person’s hearing with prolonged exposure. The amount of time a person is exposed to high levels of noise affects how much damage it will cause—30 minutes or longer at 85db or higher is considered dangerous. 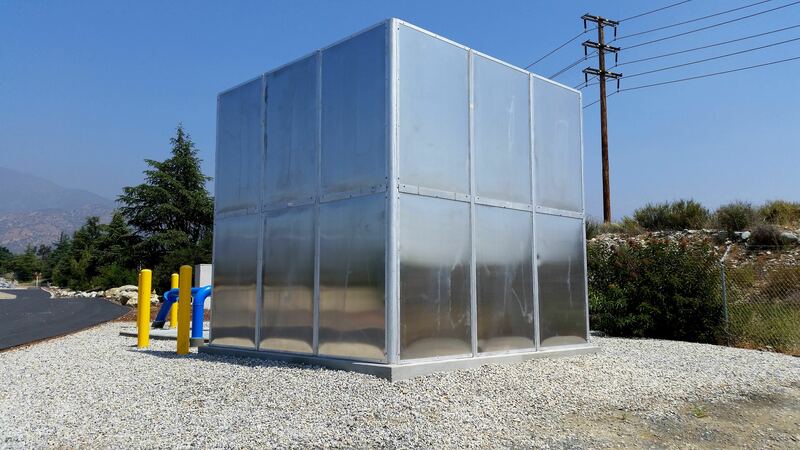 Acoustiblok’s All Weather Sound Panels have a reputation in the industry as an effective solution for difficult pump and generator noise issues because of their unique properties. They are not only sound blocking, but sound absorbing. This means they absorb reflective noises and also stop sound from penetrating through the panels. The panels have an extraordinarily high STC of 29 (Sound Transmission Class), as the panels contain large amounts of Acoustiblok’s award winning viscoelastic polymer material. This vastly superior innovation uses the isothermal adiabatic principle; as sound waves cause the Acoustiblok material to flex, internal friction occurs and the acoustical energy is dissipated into a very small trace amount of heat. In addition to being very effective on high frequency noise, AWSP’s are also effective on low frequencies; the most difficult sound blocking problems are the low frequencies (30 to 100 HZ). The annoying bass in music is predominately 40 to 80 HZ. Conventional sound barriers do dramatically less sound blocking below 100 HZ, however, because of the Acoustiblok barrier material built into each of the All Weather Sound Panels they actually increase in sound blocking from 100 HZ down. Engineered specifically to withstand the most rigorous outdoor and industrial environments; water, moisture, humidity, salt air/water, dirt, dust, constant ultraviolet light, chlorine air, grease, or corrosion; even the harshest chemicals are not a problem for AWSP’s. Because they are encased by all-welded aluminum they also prohibit vermin problems. “In this case, in addition to the noise reduction goals for the project, the environment was a key consideration in selecting the right sound barrier solution for the project. The heat, cold, rain, fluctuating temperatures, constant UV exposure and the intense Santa Ana Winds that can generate wind speeds up to 70-80 miles per hour at times made Acoustiblok’s All Weather Sound Panel s the ideal choice. They do a superior job of mitigating the noise and are also rugged enough to withstand that environment for years to come,” said Lahnie Johnson, president and founder of Acoustiblok Corporation. A sound meter was used to measure the noise levels inside the enclosure and outside once the panels were placed in position. 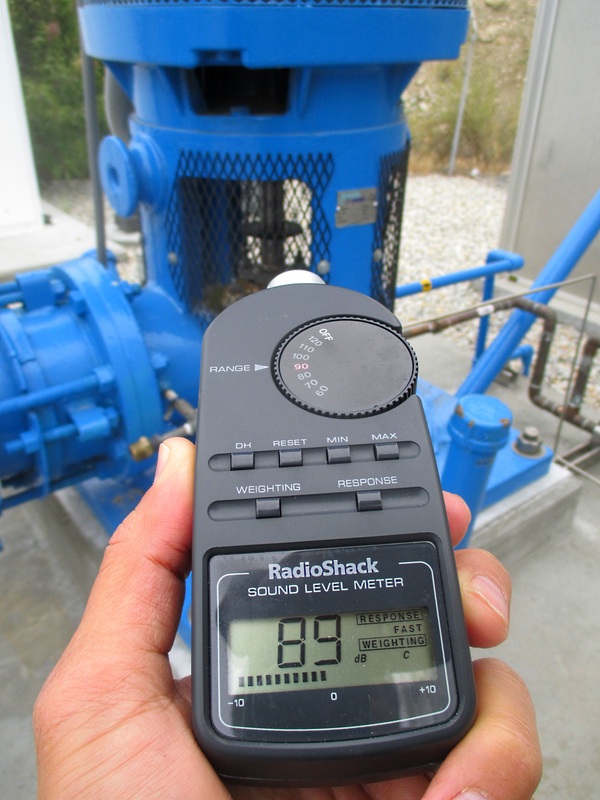 The sound meter readings inside the enclosure close to the pump were 89dB. 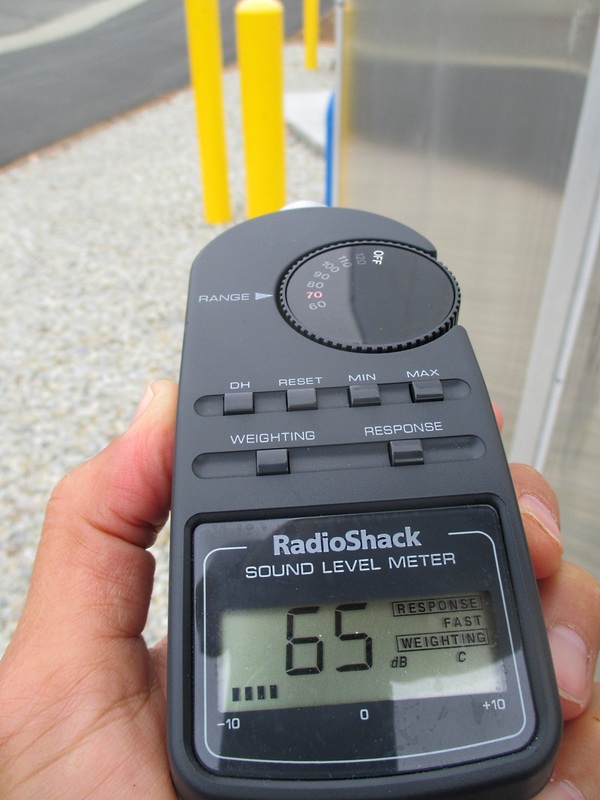 The reading outside the enclosure (behind the All Weather Sound Panels) was 65dB (see photos). This indicates a noise reduction of 24 decibels. In a 10 decibel decrease in sound level, perceived loudness is cut in half to the human ear. "The installation went smoothly and didn’t take much time at all. We didn’t encounter any unexpected problems and were very pleased with the reduction in sound decibels picked up by the meter,” said Ben. “We were also happy with the results—a 24dB decrease in sound level is significant. While the solution to the noise issue at the well site was not a complex one; it was a highly effective one that can solve thousands of similar noise issues across the country and around the globe,” said Johnson. He also noted that Acoustiblok’s success has not just been about the products invented, but more about the innovation of the products in finding solutions for people’s noise problems. “We’re a solutions company,” he said. Primary products include Acoustiblok® viscoelastic polymer-based soundproofing material, Acoustifence® noise reducing fence, All Weather Sound Panels®, QuietFiber® insulating material, Quiet-Cloud® industrial sound absorption panels, and Acoustiblok-Wallcover® post-construction soundproofing material. Acoustiblok products are used in industrial, residential, commercial, and marine sectors worldwide. The company’s products are made and sourced in the United States.